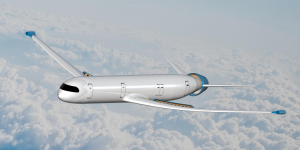 The Munich team comprised of Alexander Frühbeis, Isa Held, Patrick Sieb and Artur Usbek submitted a design called the “eRay Aircraft Concept”. The concept is designed around an aircraft with a turbo-electric flight system, which is spread out over the vehicle to take advantage of synergies between the technologies included. Chassis design also played a role, as the Boundary Layer Ingestion-Effect was utilized to increase engine efficiency. A new cabin design concept saves weight and active turbulence mitigation is also included. In total, the concept is said to have 64% less energy use than modern airplanes. Second place was won by a team from the university in Stuttgart with their “Polaris” design, followed by a team from Aachen with the “AirBox One”. In total, 41 students in seven teams from six German universities took part. The competition also had a parallel in the USA, where the winning team from the German counterpart will travel to the USA in Fall to present their project next to the American winning team in an international symposium.